The playoffs have a funny way of playing with your mind and clouding your perception of time. It feels like a lifetime ago that the Ville-Marie Pirates were on the ropes and facing the proposition of a premature post-season exit after losing playing a winner takes all game against the Bradford Bulls to start their opening-round series. Since then they’ve switched goalies, remarkably stole four of their five games on the road, and slayed every old personal demon they may have had standing in their way by getting past the Rattlers and scoring more than two goals en route to winning Game 6. 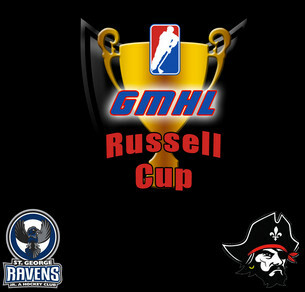 There’s also a sense of déjà vu, with the St. George Ravens making it back to the Russell Cup Finals for the second consecutive year after dominating the South Division for the majority of the season, and in the playoffs. This time, the Ravens will be hoping for a different result. The paths the two Cup finalists took to this point have been wildly different, so we decided to take a look at some of the highlights for each team leading up to this point. BEST MOMENT (PIRATES): Game 6 vs. Bradford Rattlers, North Division Final – Only one win away from making the Finals for the first time in franchise history, the Pirates had a lot of pressure to beat the Bradford Rattlers in Game 6. They were in a similar position last season against the Rattlers, when they held the series lead 2-1 in a best of five series. The Rattlers ended up winning the next two games and ousted the Pirates from the playoffs. This year the Pirates didn’t make the same mistake and shut down the Rattlers, taking the game 3-0, making it the first time the Rattlers had been shutout all year. BEST MOMENT (RAVENS): Game 1 vs. Tillsonburg Hurricanes, South Division Final – The Ravens were the best team in the South during the Regular Season by a wide margin. However, there was one team that posed a potential challenge to them in the Playoffs. That came in the form of the Tillsonburg Hurricanes. If there was any team that was going to upset the Ravens in their journey to the Russell Cup Finals, it was viewed by many that it’d be the Hurricanes. Game 1 of the South Division Finals destroyed that thought quickly though. The Ravens asserted their dominance in Game 1, winning 7-0, and shutting out what had been one of the deadliest offences in the South Division this year. TURNING POINT (PIRATES): Game 2 vs. Bradford Bulls, North Division Quarterfinals – After dropping Game 1 to the Bulls, the Pirates season was on the line, facing elimination in Game 2 of a best of three series. It was an extremely close game, heading into overtime 2-2. The Bulls had a chance to close out the series in overtime, but weren’t able to finish, and the Pirates came back the other way and put the game away, winning 3-2. Ever since that game the Pirates have been rolling, and don’t look like their stopping. TURNING POINT (RAVENS): Game 4 vs. Niagara Whalers, South Division Semi-Finals – Going into the playoffs, the Ravens had gone on a 30+ game win-streak. After sweeping Tottenham in the first round, they went up against long time rival, the Niagara Whalers. It was the Whalers who finally snapped the streak at 34 games winning Game 3 by a score of 2-1. The league held it’s breath to see if the Ravens would be able to bounce back from a loss at the hands of their rivals, or if the Whalers had maybe cracked the code to this Ravens team. The Whalers opened the scoring in Game 4, and were up 1-0 going into the 2nd period, but then the Ravens caught fire, and scored 4 goals, going on to win the game 5-2 and the series 3-1. Since then the Ravens have gone back to their dominant ways. BEST MOVE(S) MADE (PIRATES): Christmas additions and last minute trade for Labelle – On the deadline day the Pirates were pretty quiet. They had already acquired a couple of players during the Christmas Break, who would all end up being great players for them, such as Gulio Costa (G), Vincent Blanchette (F), and Karl-Étienne St-Fleur (D). These string of moves helped improve their team tremendously and it seemed like they were done adding. However, in the last minutes of the trade deadline, the Pirates made a huge splash and acquired one of the top D men on the market in Josh Labelle from the Bulls. It was a great pick-up, with Labelle having playoff experience, making the finals with the Ravens last season, and with 14 Points in 9 Regular Season Games, and 6 Points in 11 Playoff Games for the Pirates, it’s safe to say that Labelle has been making an impact. BEST MOVE(S) MADE (RAVENS): Not making any moves – The Ravens didn’t do much in adding to their team at the deadline, only adding Liam Bell, who has been consistent for the team, posting just over a point per a game for the team. However, they decided not to make too much commotion, and after that move, stood pat, happy with the team they had. With a 22 game win streak at the deadline, the Ravens didn’t need to change much, and it looks like not making any moves paid off, only losing once since the trade deadline, and making it to the Finals. PLAYOFF MVP (PIRATES): Gulio Costa – Costa was a trade acquisition from the West Nipissing Lynx earlier this year. His regular season play was good for the Pirates, however, he stepped it up to another level when they went into the playoffs. Costa has an 8-3-0 record in the playoffs with a save percentage of .933, a goals against average of 2.00, three shutouts, and earning a star in eight of the eleven playoff games he’s appeared. The Pirates have been happy with his goaltending and they hope he can continue to play hot in the Finals. PLAYOFF MVP (RAVENS): Liam Hurley – Hurley has been a top forward all season for the St. George Ravens, and he has continued his pace of play into the playoffs as well. He is the Ravens leading scorer in the playoffs right now, posting 8 Goals and 10 Assists for 18 Points in only 8 Games Played for the Ravens. The Ravens are going to need their high scoring offense against the Ville-Marie Pirates, and they hope that Hurley will continue to produce for them. One of the best parts of a playoff series can be the chess match that develops as it progresses. With these two teams never seeing each other this year, it’ll be fascinating to watch what happens when they play Game 1 and how the series progresses from there. This series begins on March 23, 2019 in Ville-Marie Quebec at 7:30 PM.